For two years I worked with the anthropologists ( thanks Deb !) at the Smithsonian on a "mummy boy " that was unearthed during construction in DC - the boy was named William White and because he had the same name as the "found " boy and because he was buried in a Fiske Casket it was thought that he was my gr grand uncle but we know now through DNA that he was not my William White. Civil War-Era Casket Vandalized in D.C.
Construction workers digging outside a Northwest Washington apartment building have unearthed a cast-iron casket that experts believe probably dates to the late 19th century. Construction workers surround the cast-iron casket they found at a construction site in the 1400 block of Columbia Road. On Monday evening, after word of the archaeological find spread through the neighborhood and crowds of onlookers had gathered throughout the day, workers locked the casket in the empty building for safekeeping. But that night, vandals went to work. According to Boyd, they bashed in the building's back door, cracked the casket's iron faceplate and broke the sheet of glass beneath it. "When I saw the damage the next day, I was shocked that someone would be so stupid, so animal-like that they would do this to something so historic and to someone's tomb," Boyd said. "It was like these people were grave robbers or something." He said that some neighbors told him they had observed several youngsters breaking into the building about 8 p.m. but did not call police. Because of the damage, Boyd could partially see the contents of the casket: a head with strands of blond hair, leathery skin and a scarf wrapped around it. He said he could not tell whether the remains were those of a man or woman. Boyd said that the workers subsequently taped the casket and moved it to another building owned by DBT Development, the company doing the work at the Columbia Road location. Boyd said that DBT will keep the casket until a representative from the Smithsonian Institution takes custody of it next week. But Randall Kremer, spokesman for the Smithsonian's National Museum of Natural History, said that one of the organization's forensic anthropologists first plans to examine the casket. "We will look at it next week to see whether we want to take it and add it to the national collection," Kremer said. "It could take a few days to complete the examination." Nancy Kassner, an archaeologist with the D.C. Historic Preservation Office, said that she has yet to examine the casket but has concerns about the effects of the vandalism on the artifact and its contents. "Air has gotten into it and probably done damage. Air can facilitate disintegration," Kassner said. She said that her office eventually would like to see the body reinterred "somewhere suitable because that's what should be done out of respect for the dead." Kassner said she believes that the casket predates Calvary Methodist Church, which is next door to the Columbia Road apartment building and was constructed in 1902, because the soil around the coffin does not appear to have been disturbed. Jane Freundel Levey, a historian for the nonprofit group Cultural Tourism D.C., said that beginning in the late 1860s, what is known today as Columbia Heights was one of the District's earliest upper-middle-class developments, checkered by large, free-standing houses. She also noted that the area between the Duke Ellington Bridge and 14th Street NW once had five Civil War hospitals. Other experts pointed out that cast-iron caskets were expensive at the time and that the individual buried in the one found in Columbia Heights might have been a person of note. Boyd said his construction team had to hold onto the casket, which was found about three feet below a gas line, because it could not get the police department or any other District agency to pick it up. Lt. William Farr of the D.C. police homicide unit said the casket was not a police matter because a homicide was not involved. "If it was just bones, it would have been a police issue," Farr said. "But because this person was in a casket, it constitutes a proper burial. There was no indication of foul play." He said that police notified the D.C. Department of Consumer and Regulatory Affairs and was told that someone from the agency was "on the way." But no one from DCRA came, Boyd said. An agency spokeswoman, Gwendolyn Davis, said that "DCRA had no role in that instance." Details Emerge Of Civil War-Era Remains in D.C.
A 19th-century boy whose body was found in a cast-iron casket in April at a Columbia Heights construction site probably died of pneumonia, a team of scientists has determined. They said they believe his family was wealthy. The body is that of a 13- or 14-year-old boy who died in the mid-1800s, said Michele Urie, a spokeswoman for the Smithsonian Institution's National Museum of Natural History, where the team is working. Because the casket was tightly sealed, the level of preservation is "extraordinary," Urie said. "To find one is rare," she said of the casket. "To find one that has been sealed and airtight is very rare." Led by forensic anthropologist Doug Owsley, the group doing the analysis includes pathologists, anthropologists and a clothing expert. Archaeologists and D.C. historians will try to determine the boy's identity, Urie said. They will also research whether the location where the body was found is a former cemetery site. It is possible that the boy's grave was accidentally left behind when a cemetery was moved. Urie said the pants, shirt, vest and socks the boy was buried in are characteristic of 19th-century fashion. The use of cast iron for the casket indicates that the boy's family was wealthy; cast iron was expensive, especially after the start of the Civil War, when it was in heavy demand, she said. The scientists plan toxicological and pathological screens that could reveal evidence of other diseases, medicine the boy may have taken and his general health. "It's a great insight into what life in Washington, D.C., was like in the 1850s," Urie said. The casket was unearthed at 1465 Columbia Rd. NW by a construction crew. The discovery soon drew crowds, prompting workers to lock the casket in an empty building. That night, vandals broke in, cracked the casket's faceplate and broke the glass below. The Smithsonian took possession of the casket the next week, but only now has a team of scientists had the opportunity to fully analyze the remains, Urie said. 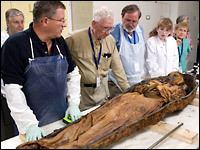 Morning Edition, August 5, 2005 · An iron casket that remained sealed for over 100 years has been opened by researchers at the Smithsonian Institution. 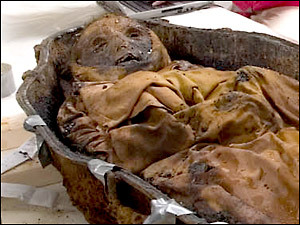 The well-preserved body offers clues to life in an era that has long passed. Scientists will try to read those clues before returning the body to the ground with a proper burial. 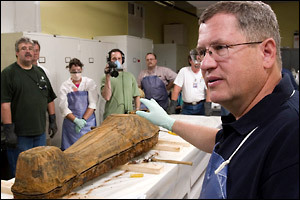 Smithsonian forensic anthropologist Dr. Doug Owsley prepares the team before opening a 19th century cast iron coffin found in Washington, D.C., in Spring 2005. 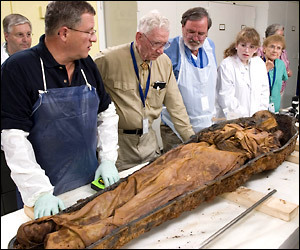 From left to right, Smithsonian forensic anthropologist Dr. Doug Owsley, pathologist Dr. Arthur Aufterheide, pathologist Dr. Larry Cartmell, Smithsonian volunteer Marta Camps, pathologist Mary Aufterheide examine the remains of a 19th century individual discovered in a rare cast iron coffin. The head of the body is wrapped with a scarf close to the mouth. Scientists believe the body is that of a 13-year-old boy. 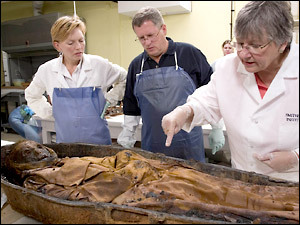 Smithsonian forensic anthropologists Kari Bruwelheide and Dr. Doug Owsley, Smithsonian clothing historian Shelley Foote examine the remains of an 19th century individual discovered in a rare cast iron coffin.